Welcome to the St. Paul Catholic High School School Counseling Department. We are eager to assist you with your counseling needs and requests for information. Academic Guidance – Guidance which assists students and their parents in an effort to acquire knowledge of the curricula and to explain choices available to students, to plan a program of studies, to arrange and interpret academic testing, and to seek post-secondary academic opportunities. Career Guidance – Guidance which helps students to acquire information and plan action about work, jobs, apprenticeships, and post-secondary educational and career opportunities. Personal/Social Counseling – Counseling which assists students to develop an understanding of themselves, the rights and needs of others, how to resolve conflict and to define individual goals, reflecting their interests, abilities and aptitudes. Such counseling may be provided either (i) in groups in which generic issues of social development are addressed or (ii) through structured individual or small group multi-session counseling which focuses on the specific concerns of the participant(s). 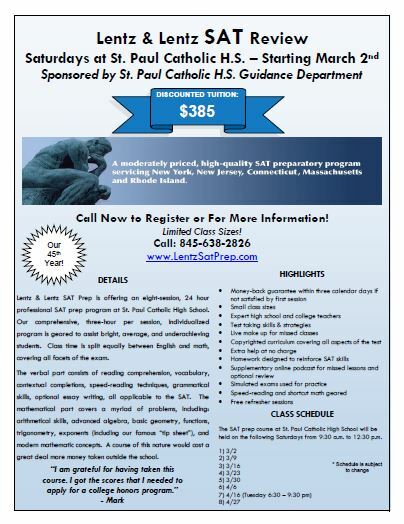 Transcript Request Form – To request a copy of your transcript please download this request form and send to the St. Paul Catholic High School Guidance Office. College Admissions Representatives, if you are looking to schedule a visit please use www.RepVisits.com, as we are solely using this platform to book visits.